Down, down, down, and then up, up, up to Mount Bures and its sturdy little church hard against the Suffolk border. This is a remarkable place. 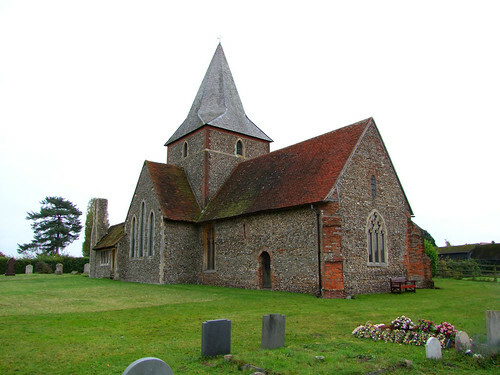 The church is a cruciform Norman church which was once associated with a Norman castle. You first see it across the hilly fields, and for a moment it was hard to believe that this was really East Anglia, what with the hills and the signs of former iron industry. Close up, it is clear that the central tower was rebuilt in the 19th century, and in truth the interior is almost all 19th century too, but it is a real touchstone of a place, and I liked it a lot. The view to the east of the church across the Vale is splendid.